This pattern is complete with instructions to make Vasalisa in 7 inch and 5.5 inch sizes, her "skull" torch, the story book, and a pocket to carry them in. 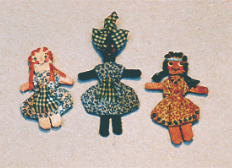 Includes materials and instructions to complete 3 miniature dolls. Includes materials and instructions to complete the miniature double doll.